The western tarnished plant bug, Lygus hesperus has a wide host range and is an important pest of many crops. It is commonly referred to as lygus bug and is a major pest of strawberries on the California Central Coast. In the recent months, it has emerged as a major threat to celery causing significant yield losses which, in some cases, lead to a complete loss of the crop. Lygus bug feeding causes fruit deformation in strawberry, but the damage is quite different in celery. Lygus bug punctures celery stalks with its piercing and sucking (needle-like) mouthparts to feed on plant juices. Damaged tissue results in brownish, sunken, elongated lesions. Such lesions are usually seen below the first node, but feeding of the nymphs (or adults) on the inner and developing parts can result in dark spots and twisted or distorted growth. Nymphal instars and adult L. hesperus. Lygus bug is a hemipteran pest (Family: Miridae) and prefers to feed on plant parts that are high in lipid and protein content such as developing seeds. Flowering weed hosts such as wild mustard and wild radish and cultivated crops such as alfalfa are among the favorite hosts of the lygus bug compared to strawberries or celery. However, when vegetation in the uncultivated areas dries out in late spring, lygus populations disperse in search of food and migrate to other crops. Intensive agriculture on the fertile and environmentally ideal Central Coast offers a never ending food source of a variety of crops to the lygus bug. Drought and warmer conditions can dry up wild habitats and force the migration of lygus bug populations sooner than usual. Pests require less time to develop and complete their life cycle in warmer climate resulting in increased infestations. Cold temperatures during winter months typically reduce populations of several pests, but milder winters aided by an endless supply of food sources may also contribute to the carryover of lygus bug and other pests to the following season resulting in continuous and/or early infestations. Under these circumstances, using degree-day models or other such tools appear to be impractical in predicting lygus infestations. Farms have boundaries, but pests do not have such limitations and freely move from one field to another. Effective pest management is thus necessary not only to limit damage to the infested fields, but also to limit the spread to other fields. In 2013, ineffective management of whiteflies on strawberries lead to their build up and resulted in the outbreak of an uncommon disease known as viral decline of strawberry (pallidosis-related decline). Increased outreach helped growers to take appropriate management decisions and reduce whitefly vector populations. Similarly, effective and timely management of lygus bug on strawberries or other hosts is very important to prevent their spread to other crops. When a pest issue emerges, it is not uncommon to put an emphasis on chemical pesticides for bringing populations down to manageable levels. However, efficacy of various pesticides vary due to their modes of action and other factors and resistance of some populations make otherwise effective chemistries less efficacious. 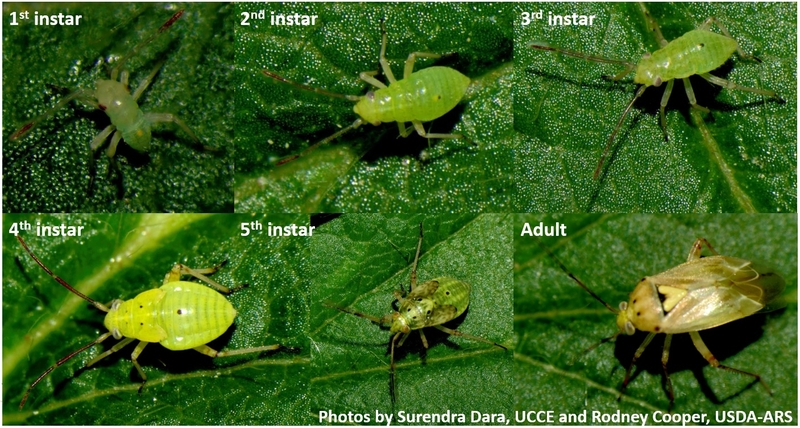 It is important to implement IPM strategies and use cultural, biological, botanical, chemical, microbial, and other options rather than relying on one or two options for managing lygus bug and other pests. When chemical pesticides are used, rotate among different modes of action groups to reduce the risk of resistance development. According to the Santa Barbara County Ag Commissioner's office, failure to take timely actions to manage a pest that could become a major issue to the neighboring fields, can have legal implications. To know more about lygus bug management and recent IPM studies, attend the Annual Santa Maria Strawberry Meeting on 10 November, 2015 at the Santa Maria Library. Register at http://ucanr.edu/2015strawberrymeeting.